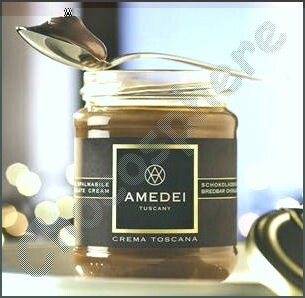 Amedei Crema Toscana alla Nocciola Gianduja Spread is the perfect blending of hazelnuts with just a touch of chocolate for a traditional Gianduja taste. It is more than just a hazelnut and chocolate cream, it is a symposium of flavor that brings together prestigious guests: outstanding cacao from the Tessieri family's plantations, and the finest hazelnuts, selected and toasted in-house by Amedei, to release all the intense sweetness of their aroma. And then there's brown sugar and top-quality vanilla. All of this is blended together with the love, expertise, and unique skill that only Amedei can impart to its creations. 200g/7oz net wt. per jar. Net wt. 200g/7oz.